I have recently migrated my website from a shared hosting to a dedicated VPS on Digital Ocean. Having a VPS surely gives you unlimited possibilities, compared to a shared hosting, but of course you have to manage some services by yourself. In my case I only needed: SSH access, LEMP configuration (Nginx + MySQL + PHP) to serve my WordPress blog and Postfix to use email forwarding from my aliases to my personal email. Understanding how to properly configure the DNS entries in the panel could be a bit tricky if it's not your daily bread. In particular there is a Digital Ocean configuration that assumes certain things about your droplet, so it's better to configure it properly. 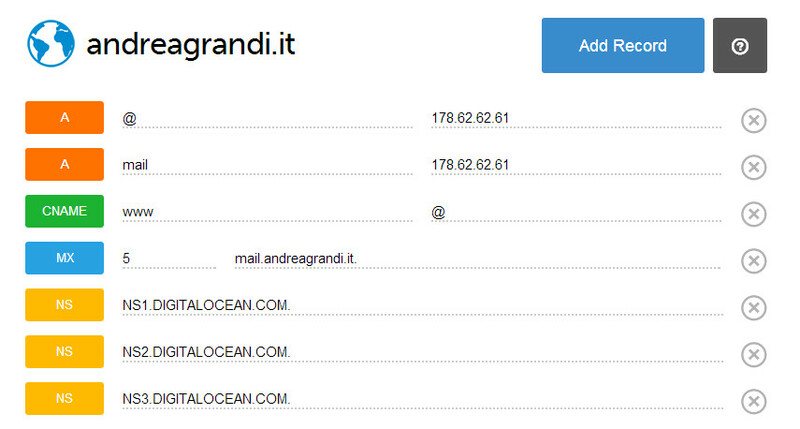 For example the droplet name should not be casual, but it should match your domain name: I initially called my host "andreagrandi" and I had to rename it to "andreagrandi.it" to have the proper PTR values. You will need to create at least a "mail" record, pointing to your IP and an "MX" record pointing to mail.yourdomain.com. (please note the dot at the end of the domain name). Here is the configuration of my own droplet (you will notice also a CNAME record. You need it if you want www.yourdomain.com to correctly point to your ip.